Well finially got 0.3 finished for Kudus. This is a major rewrite, and now it uses a different front end completley. Added a new version that fixes some bugs with co-planar polygons. Finally back again. My site has been sitting ignored for a while but I've decided to refresh the design, and will be adding a few new things. Including a new version of Kudus, some web based examples and games, and also an update to KPodder (which is taking a while). Plus there may be some pictures as well. Changed the name of BPConf for several reasons, but it was actually a request that finally swung it, and the fact that I have now made quite a few changs to the script. Anyway lots of new things and improvements. 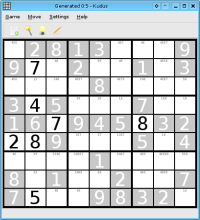 Been playing around with this for a while but this is my Suduko game for Linux. It Generates puzzles from very easy to fiendishly difficult ( but all are solvable ). It can also solve any Suduko game that can be solved.